Here's How To Take A Blood Pressure Reading The Right Way : Shots - Health News New guidelines have lowered the threshold for high blood pressure to 130/80, which makes it even more important to get an accurate reading. Here's how to increase the odds of getting it right. 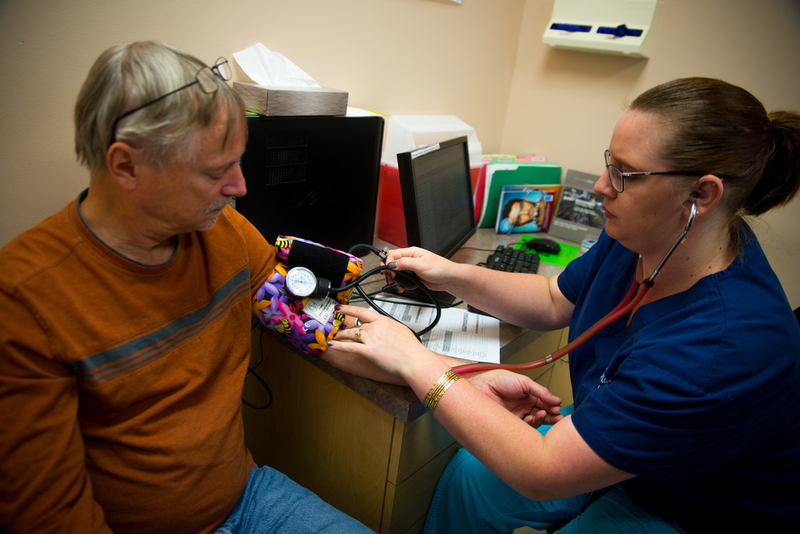 Emily Blair, a medical assistant at the Colon, Stomach and Liver Center in Lansdowne, Va., takes a blood pressure reading for Robert Koenen. New guidelines say that patients should have their arm resting on a surface while taking a reading and both feet should be placed flat on the ground. Paul Whelton, a cardiovascular specialist at the Tulane University School of Public Health, says airplane pilots always run down a safety checklist before taking off. "We would be shocked if a pilot told us he was in a rush and just didn't have time to do it." Yet he says clinicians aren't taking enough care to make an important measurement when it comes to health: reading blood pressure values. That is topical right now because Whelton is among a group of physicians who have just recommended new standards for blood pressure. Now, if your blood pressure tops 130 over 80, you are in unhealthy territory. Having an accurate measure is important because more people than ever may be keeping a close eye on their blood pressure and trying to keep it in a healthy range through diet, exercise and potentially medications. The new guidelines from the American Heart Association and the American College of Cardiology, released Tuesday, which lowered the threshold for diagnosing high blood pressure from 140/90, mean that nearly half of the U.S. population will be considered as having high blood pressure, with the greatest impact on younger people. Do: Sit in a chair, feet flat on the ground, legs uncrossed, with your back supported and without talking, for at least five minutes before you get your blood pressure measured. Don't: Exercise, consume caffeine or smoke within 30 minutes of your test. Do: Empty your bladder before your blood pressure is taken. Don't: Sit or lie on the exam table. Whelton says that can result in a falsely low blood pressure reading. Do: Roll up your sleeve so the blood pressure cuff rests on bare skin, not clothing. Don't: Let your arm dangle or rest in your lap during the reading. It should be supported on a surface such as a desk. If your blood pressure appears high, your doctor's office should take a reading in both arms. And next time you come in, the reading should be from the arm that showed the higher blood pressure. There is no single number that determines your blood pressure — it can vary throughout the day and be influenced by something as simple as being approached by a well-meaning nurse carrying a blood pressure cuff. So the new checklist says the diagnosis of high blood pressure requires at least two readings on separate occasions.